It’s that time of summer when September issues of fashion magazines feature burgundy and booties, offering us suggestions for how to squeeze every last wear out of summer clothes. But don’t be fooled–summer’s not over yet! The only thing you should be squeezing is a fresh lemon for some au nauturel highlights or a hits-the-spot lemonade. In an effort to prove that summer endures, I’ve recently gone a bit wild at our local farmers’ market. I stocked up on peaches, nectarines and plums that could feed my own family for weeks. Soon, I’ll be spritzing some Jo Malone nectarine and honey blossom over my pale body, wishing I could turn back the clock to these days when rosy fruit, soft to the touch, livened up our kitchen table. I can’t refuse a good stone fruit atop yogurt with my favorite granola, grilled with arugula, in salsa or even with pesto, or naked and dripping right onto the hot sand. 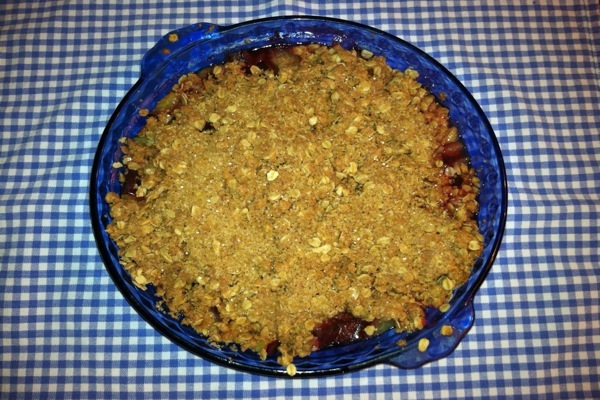 While taking refuge in the kitchen from from a summer storm last weekend, I attempted this slightly healthier crumble to diminish my mound of fresh peaches and plums. 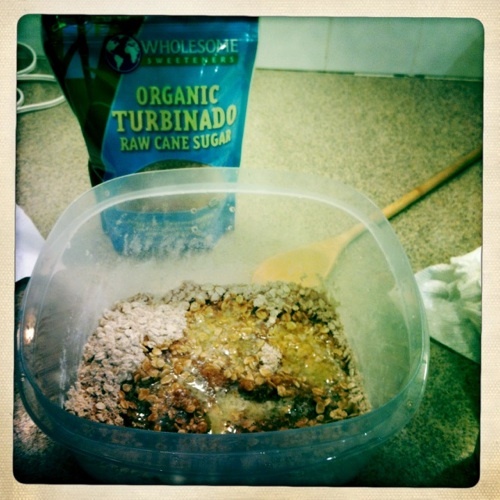 I decided to go with large crystals of turbanido sugar to add texture, inspired by the Dirt Cowboy’s (Hanover, NH) strawberry-banana muffins, which have an addictively sweet and crunchy sugar top. This recipe incorporates yogurt and whole-wheat flour, making it healthier and not at all cloying. A perfect dish for a low key dinner or BBQ to feature the season’s bounty. Brooke Elmlinger is a rising senior at Dartmouth College, currently interning and crumble-making in NYC. 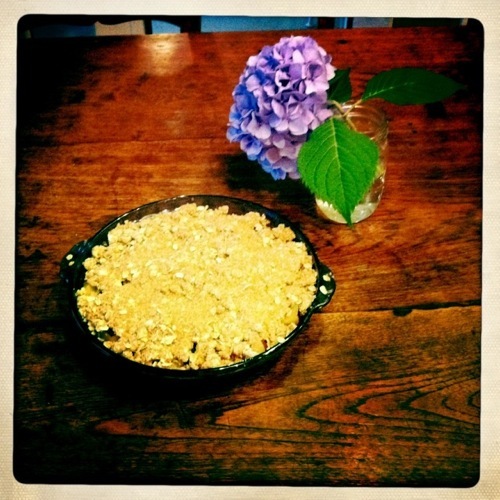 She already has her mind set on an apple version of this crumble, with some swoon-worthy REAL maple syrup. Cut the stone fruit into bite-size pieces (easiest to quarter the fruit, cutting around the pit, and cut from there). Set aside. In a small bowl whisk together ¼ cup sugar with the cornstarch. Sprinkle this mixture over the fruit and toss gently. Transfer fruit to a pie dish or tart pan (a square dish works fine as well, opt for something close to 8 inches). Bake in the oven for about 25 minutes, or until the crumble turns golden. Enjoy unadulterated, with ice cream, or freshly whipped cream.